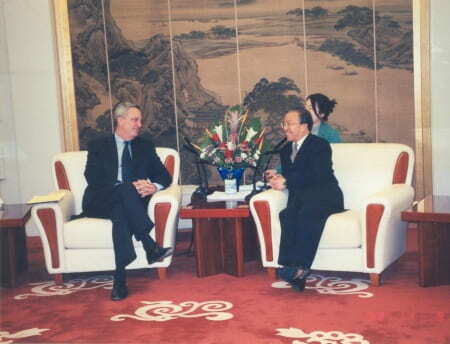 China Policy Program Director Professor David Shambaugh meets with State Councillor and Director of the Central Committee Foreign Affairs Office, Dai Binguo, 2008. The China Policy Program was established in 1998 as one of several constituent programs in the Elliott School of International Affairs, and it is affiliated with the Sigur Center for Asian Studies. The founding Director is David Shambaugh, Professor of Political Science & International Affairs, who is a leading international authority on contemporary China and Asian affairs. The China Policy Program was created to build upon the Elliott School’s longstanding expertise and involvement in U.S.-China relations and contemporary Chinese affairs and to serve primarily as an outreach program to the policy community in Washington, officials and China specialists around the world, the media, and the public. Sponsoring occasional public lectures and panel discussions open to the public and GW community. Sponsoring the publication of scholarly books related to Chinese affairs. Sponsoring discussion meetings of Washington’s leading China experts drawn from academia, think tanks, the U.S. intelligence community, Congressional staff, and executive branch officials. Sponsoring “policy dialogues” of a reasonably high-level, with participants from China, Europe, and Asia. Receiving and briefing visiting delegations from Asia, Europe, and the United States on issues related to China. Hosting in residence individual officials, scholars, and China specialists from around the world. Sponsoring media briefings, pegged to current and medium-term events in China and U.S.-China relations. Sponsoring tailored briefings for Executive Branch officials, Congressional staff, and Members of Congress related to China and U.S.-China relations. Sponsoring tailored briefings for members of the corporate community related to China. Convening “study groups” to assist authors in revising book and article manuscripts. In recent years the China Policy Program has sponsored activities in all of these areas. For further information please contact the Director, Professor David Shambaugh, at 202-994-5887 or shambaug@gwu.edu.